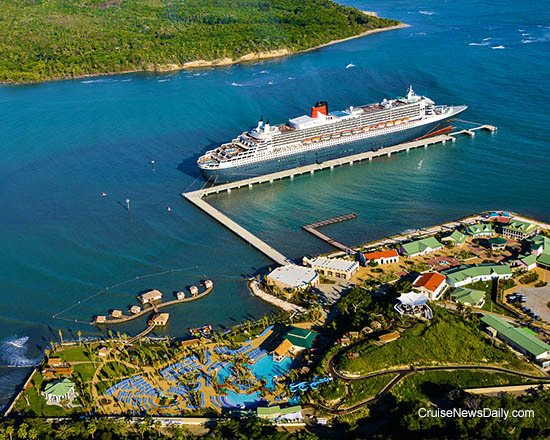 Carnival’s new port in the Dominican Republic, Amber Cove, welcomed Queen Mary 2 for the first time last Sunday (November 22). It was also the first call ever in the Dominican Republic for QM2. 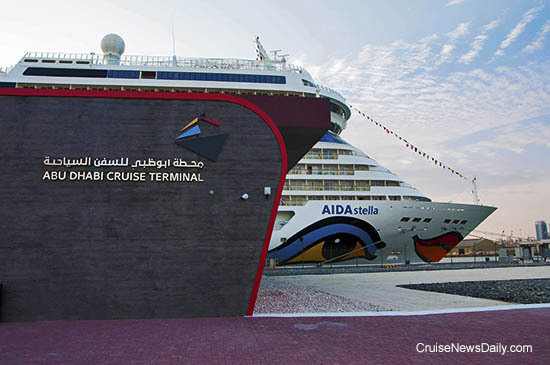 AIDAstella was the first Carnival Corp ship to utilize the new cruise terminal at Mina Zayed in Abu Dhabi. AIDA and Costa have developed Abu Dhabi into an important turnaround port for German and European passengers. AIDA and Costa will have 60 calls at the port in 2016. Photo courtesy of AIDA Cruises. All rights reserved. Many not be copied or used without permission. Seattle, Wash., Nov. 25, 2015 — This Thanksgiving, guests aboard Holland America Line’s fleet of 13 ships are in for a culinary celebration as they indulge in gourmet dishes designed by Master Chef Rudi Sodamin. The tantalizing menu will feature an array of traditional and more contemporary specialties, including appetizers, soups, salads, entrées, desserts and Thanksgiving-themed cocktails. Sodamin created the menu with his own traditions in mind, having grown up in a large family in Austria where holiday meals were meaningful. After Sodamin moved to New York to work at the Waldorf-Astoria Hotel, he learned about Thanksgiving and all of the menu staples that come with it. Holland America Line’s culinary team of thousands of expert chefs will prepare flavorful feasts that will be served in the main dining rooms across the fleet on Thursday, Nov. 26. Guests can start the meal with ambrosia fruit; Pilgrim’s meat terrine with a Waldorf salad, dilled shrimp and mandarin-orange-cranberry chutney; or a shrimp cocktail. Soups and salads include a spiced pumpkin soup, sweet corn soup, carrot vichyssoise or bib lettuce salad with red beets. Guests anticipating a traditional Thanksgiving entrée can savor the roasted turkey served with apple and sausage stuffing, giblet gravy, bourbon-infused candied sweet potatoes, Brussels sprouts, glazed dilled carrots and turnips, and cranberry orange relish. Guests opting for more contemporary dishes can dine on brown sugar-glazed salmon, honey-baked ham, beef tenderloin “Oscar” or pumpkin ravioli with Champagne Parmigiano-Reggiano cream. Desserts are always a highlight of any Thanksgiving feast, and Sodamin has created five special options: classic pumpkin pie, apple pie à la mode, chocolate pecan pie, pumpkin tart and a Thanksgiving sundae with apple cider-spiced peaches and walnut brittle crisp. No meal would be complete without a pre- or post-dinner cocktail, and Holland America Line’s beverage team created the perfect drinks to complement the menu. The Midnight Pumpkin includes tequila, Cointreau and pumpkin purée, while the Purple Haze is made with vodka, Chambord and lime juice. After dinner, guests can complement their celebration with a Pumpkin Pie cocktail made with Baileys, Kahlua and pumpkin purée. A few months ago, Cunard brought their three Queens together, but P&O Australia has outdone them. This morning P&O made history by bringing their five-ship fleet together in Sydney Harbor. Not only that, but it was the first time two ships have been christened simultaneously - and the first time any ship has been christened via social media. Of course the two ships being named were Pacific Aria and Pacific Eden (originally Holland America’s Ryndam and Statendam). Details appeared in the November 24 edition of Cruise News Daily. A recurring storyline on sitcoms is having someone stay in a department store after it closes and living in the furniture department in the model rooms that are set up. AIDA is giving someone the chance to do something similar to that, and they could even book it on Airbnb. The complete story appeared in the November 24 edition of Cruise News Daily. When Carnival first announced Fathom, it sounded like a rather somber week. People would spend their days doing volunteer work at the destination (in the Dominican Republic or Cuba), and the rest of the time they would be learning about the culture and preparing for the next. As it turns out, Fathom is going to be much like any other small ship cruise, except most everything will be themed around the destination - in particular the food, entertainment and enrichment programs. Details appeared in the November 23 edition of Cruise News Daily. Back in September, we told you about a miraculous incident aboard Independence of the Seas a few weeks before when it was far out at sea. A family of three was getting in a final vacation before the mom was expecting to deliver the family’s second child. She was only halfway through her pregnancy, and there had been no problems, so the woman’s doctor approved the trip. The baby had other ideas and decided to make his appearance during the cruise when the ship was still almost a day away from the nearest port. The complete story appeared in the November 23 edition of Cruise News Daily.